When we talk about trauma, we are talking about an overwhelming and disorganising experience that has pushed us beyond our normal capacity to cope. Traumatic experiences are not necessarily long lasting nor debilitating because, as human beings, we are born with the ability to overcome trauma, and generally, we do so. Unfortunately, sometimes we do not return to “normal” after overwhelming events. Our lives are changed dramatically and as a result, many people can live for many years coping with the acute pain and profound distress. Not everyone who has experienced trauma will need individual psychotherapeutic support. A significant number will do so. However, all of us need information and guidance to understand the impact of trauma and what to do about it. It is important to remember, however, that you have survived in whatever way was possible at the time and over the years since then. So why are there long term effects for some people? It is important to realise that your experience is unique. 1. Every human being experiences the same impact of trauma in the body, no matter where we live or the origin of the traumatic event. 2. However, each of us has a unique personal history – what we remember, our emotional response, how we understand the events in our lives – and so our experience of traumatic events are different to anyone else’s including those who may have been in the same event. 3. The family and cultural context will also influence how and what we remember what meaning events have and our emotional responses and consequently our behaviours. What happens if the impacts of trauma continue after the event. As a result of trauma, we lose our natural rhythm for managing our day to day lives. We are designed to have this rhythm i.e. the easy rhythm of getting things done, of rising to the occasion, completing the job, feeling satisfied and resting is knocked out of synch. 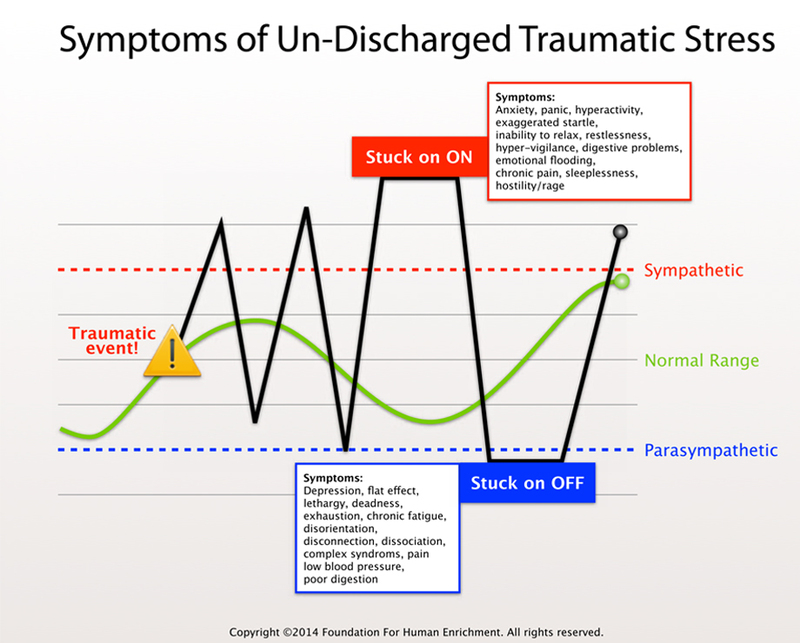 Surviving trauma however, requires a huge charge in the system. We need to be able save ourselves – that is to use our instincts to fight back or get away. When we can’t do either because for example, we are too small / young / frightened / cornered/ captured/ weak/ alone etc, the human system shuts down and freezes at the height of the experience in order to ensure that we can survive. That’s why we say things like scared stiff, frozen to the spot, caught like a rabbit in the headlights etc. Whilst this ensures survival at the time, it feels as if the experience goes on and on, that inside we can never get away from it. This is because the charge needed to survive is not used up and it feels on the inside as if the event was still happening. The body remains in this frozen state whilst people continue with the ordinary business of rearing families, going to work, caring for relatives, get involved in community activities, doing exams, getting by. At the same time, people suffer great distress as they attempt to manage the overload in the system and live “normally”. The purpose of trauma support must be to reset this rhythmic movement of ease and resilience which is the natural state of human beings. People usually seek support when the survival pattern that helped them to get on with life, isn’t working anymore. Distressing symptoms cannot be managed so easily any more. When these become disruptive in daily life, many people seek medical intervention for symptom relief, usually through medication either prescribed by the doctor or bought over the counter in the chemist. Sometimes people try to hold off the pain by using alcohol or drugs. Many of these interventions may help to reduce symptoms in the short term. This relief is to be welcomed. However, short-term interventions do not re-educate our bodies to be at ease naturally. Then – often as a result of a referral by the GP – people seek other forms of help e.g. counselling, self help strategies. For many this can become an endless, repetitive, often despairing, search for ease and relief. Modern trauma research shows clearly that trauma is not just to do with the mind or the emotions. Trauma is an embodied experience, which means it is felt and encoded in every aspect of the human being and first and foremost in the physical body. When someone seeks help with these symptoms and conditions, it is important that that they see someone who is experienced in working with the physical symptoms of trauma as well as the emotional and psychological.